Gentedimontagna is collaborating with on Hello Again, a series about interesting hotels around the world. 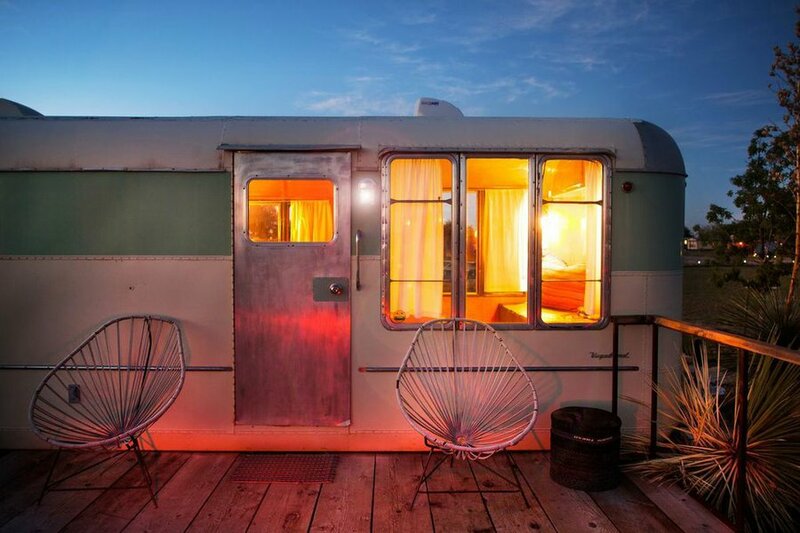 El Cosmico in West Texas redefines the trailer park as a creative hotel and community art project where time stands still. MARFA, Texas – If Texas considers itself the boldest state in the Union (it's not a state, it's a state of mind), and Marfa is the most unusual town in Texas, then it stands to reason that , the most interesting hotel in Marfa, is exceptional for many, many reasons. Marfa is a small and remote town in the West Texas high plains desert near the Mexican border, with a population just over 2,000 people. But it feels less like a town and more like an ambitious art project. Which, in fact, is how Marfa evolved from its original ranching roots. In 1979, American artist established the , and Marfa has been drawing the international arts crowd ever since, for its many contemporary museums and creative projects, like Army barracks turned into galleries and old school buses rejiggered as restaurants. This is the spirit that informs El Cosmico, an 18-acre hotel and community project that's the brainchild of Liz Lambert, the hotelier behind the charming and trendsetting and , as well as , all located in Austin, Texas. Accommodations at El Cosmico consist of teepees, safari tents, seasonal yurts, and campsites. But the real attraction? 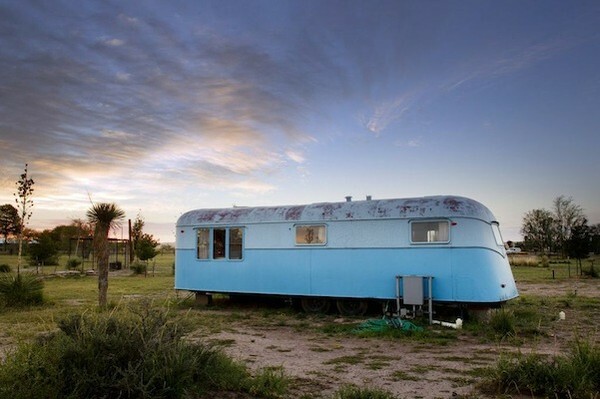 Seven beautifully restored 1950s-era mobile home trailers. The trailers are named for their years and makers, resulting in names that are at once nostalgic and whimsical. Would you prefer to move into the 1956 Imperial Mansion, the 1953 Vagabond, or the 1951 Kozy Coach made in Kalamazoo? The Imperial Mansion, at 45 feet in length, is the largest, with king and twin beds. 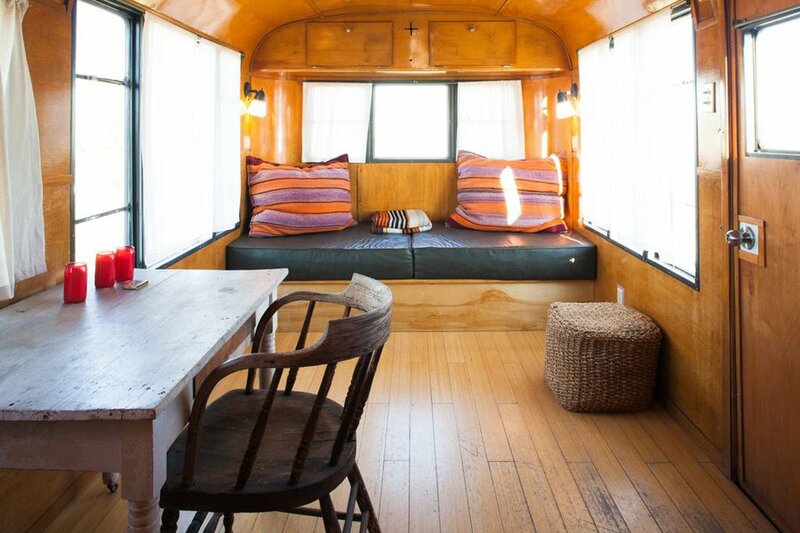 The others range from 28 to 35 feet in length and have full or queen sized beds and outdoor showers. Many have cedar decks and the 1950 Branstrator has an outdoor tub. The exteriors are vibrant, primary colors — yellows, blues, greens, and reds — while the interiors have been outfitted in warm birch, with fully equipped kitchens. Blue trailer against the pink sky in Marfa desert. Each trailer feels a little like a ship — tight and compact, efficient and polished. 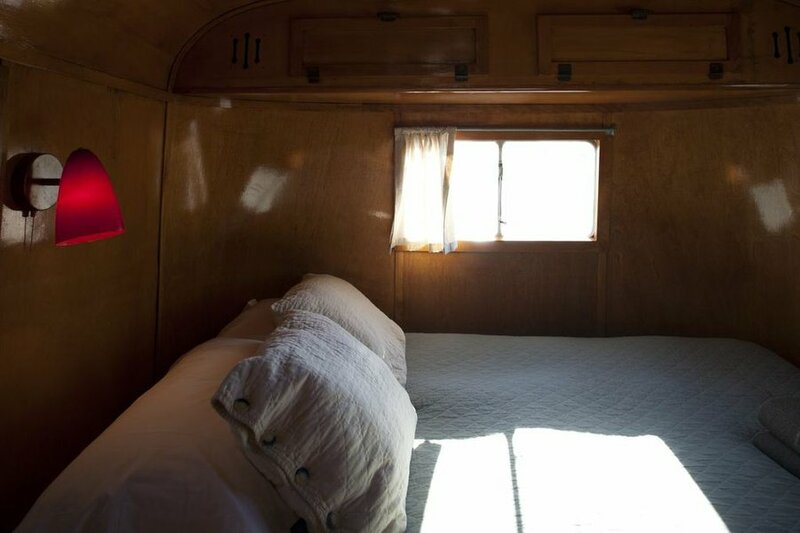 But charm abounds at El Cosmico: in the beanbag chairs in the corner, in the antlers on the wall, in the carpets in the reds and oranges of a big sky sunset. The décor is inspired by a mix of the West Texas landscape and travels to the Middle East, India, and South America. Thoughtful and design-minded amenities include heated floors and air-conditioning, Tivoli radios, Dr. Bronner's soaps. The cute oddball in the trailer family is Little Pinky. At 18 feet, it's the smallest of the trailers, and is painted bright pink. It has an outdoor shower and toilet. The hotel hosts events and workshops that quickly sell out. This summer's events include , wherein participants will design, source materials for, and build community-based projects that will benefit local Marfa kids. In August, there's Camp Cooking with chef Lou Lambert, the CIA-trained chef who is the brother of Liz. Fall brings the annual , which in years past has featured Martie Maguire from the Dixie Chicks and Ben Kweller. 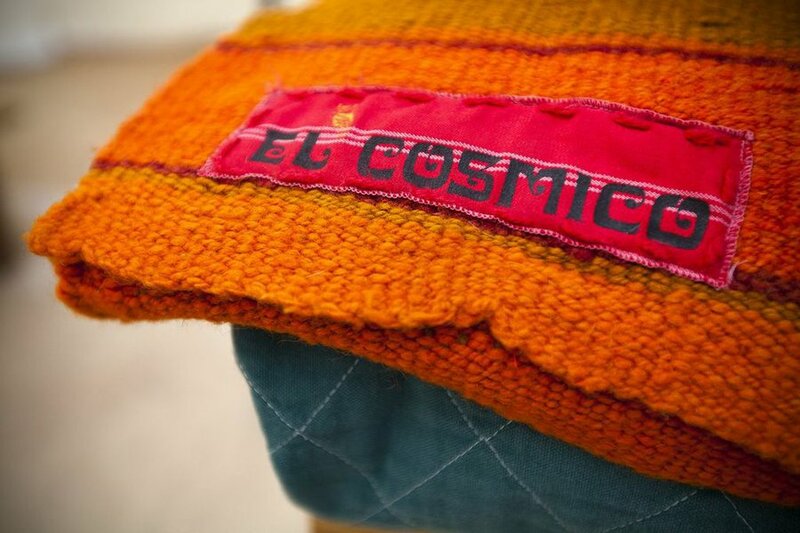 To stay at El Cosmico is to step back in time. No televisions, telephones, or Internet access (though WiFi is available in the main lounge). Daytime activities often revolve around workshops and artistic projects, while talking to your old and new friends under star-filled skies fills at night. If you need to make your way back to the trailer after dark, the staff provides flashlights, naturally. Many hotels have style, but few go so far as to have a that outlines their ideals, inspirations, and vision. And it's this vision that has people returning for more — more simplicity, more connections, more ease — time and again. The manifesto sounds especially compelling to exhausted, overworked vagabonds, who will probably agree that "Sometimes the only way to make something really amazing is through a steady balance of kicking the dirt around and napping." At night... somebody get the flashlights. 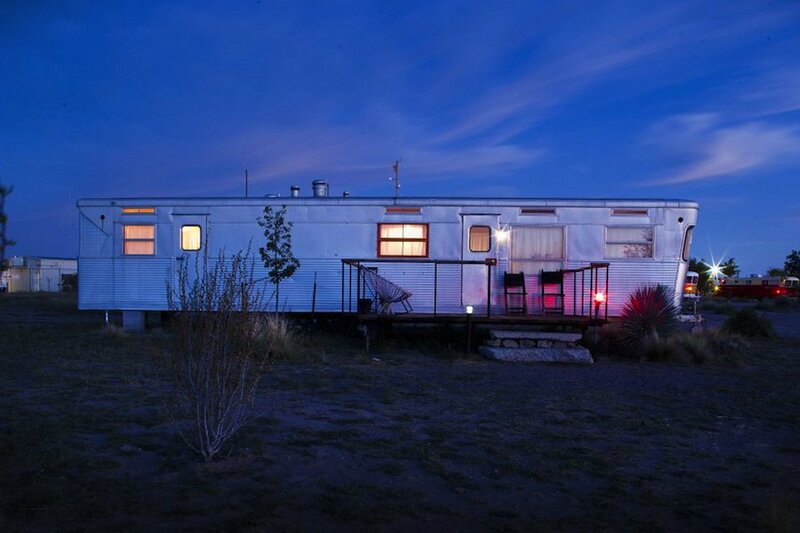 An trailer in the desert of Marfa. Warm birch and cozy furniture. The room equipped with a full sized bed. Stay in and relax under the stars.